My Blissful Journey: Vegan 'Meaty' Stew? I have to admit this sort of freaked me out! Even my mother said it looked like 'meat' you would put in a stew. It's not. It's actually Jackfruit! 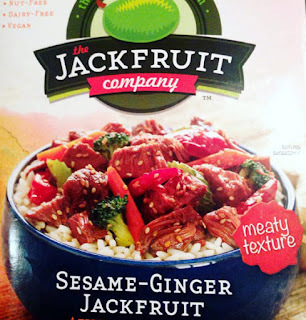 My mother is not a vegetarian and she sampled a little bit of this Sesame Ginger Teriyaki Jackfruit and thought it tasted like meat, too! Normally I am not a fan of meat alternatives or fake meats but I think because this is straight up fruit based it seemed to be better than a lot of the others you see on the market. 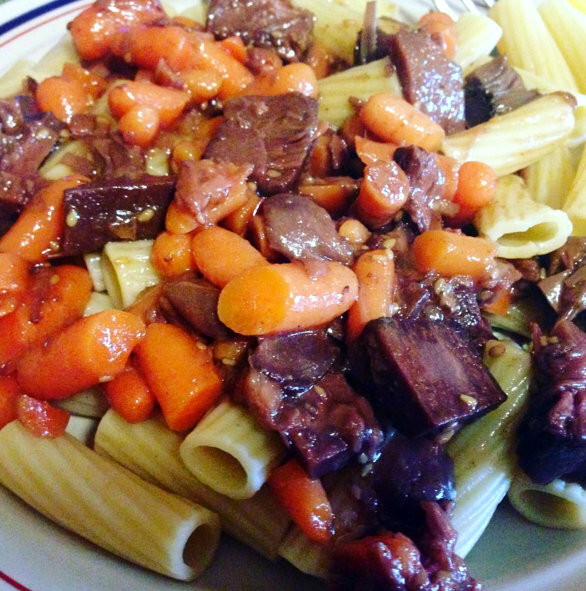 It came as a packet that you could heat and serve and I just added carrots to it and poured it over pasta. Here's a photo of the package! It's from the Jackfruit Company. It's Nut-Free, Dairy-Free, and Vegan. It's the Sesame Ginger flavor. Overall it was a very impressive product. I don't think it's something that I would eat everyday as it was a little more salty than I like...but it had a good flavor. The reason I bought it was purely because of the Jackfruit! It's rare to find Jackfruit anything around me! I've only ever had Jackfruit flavored things and have also had dried Jackfruit that I bought from The Raw Food World. This was a nice change and certainly gave me some ideas as to what to do with it if I can find some down the road. Other ideas that I am drawn to are Jackfruit Tacos and Jackfruit Sandwiches (instead of Pulled Pork Sandwiches), for example. That's so cool that you found that, I've never heard of that brand or flavor, but I love sesame ginger anything! I love making BBQ jackfruit sandwiches with slaw on top! I think I got this in Ohio! Went to the Whole Foods Market there about 2 months ago? Maybe a little less than two months!? That is cool. We don't have prepared jackfruit products like that here. But I can buy the young jackfruit in brine so I have done a couple of slow cooker recipes that were nice. Oh!!!! I'd be interested in seeing those recipes! I am lucky to have asian food markets near me so I was able to save some cash that way. It is so yummy. I would always get pulled pork sandwiches before vegan and always get disappointed- it tasted too much of meat. Then when I used jackfruit it was like exactly what I wanted- all BBQ flavors! Interesting! I will keep an eye out for more Jackfruit products that is for sure! Very cool and it looks good! I have sampled jackfruit products, but have not purchased any yet and will be looking for this! There is a massive international market not that far from us that I've been planning to make a road trip to soon. I wish there were more world markets near me!!!! I've really been getting into jackfruit lately; it's definitely freaky-lookin when it's in the pan! I would love to see pics of your dishes! I really want to try Jackfruit! People can't seem to stop talking about it, and I do like the idea of a fake meat that is a bit more natural. I know what you mean :) It's seems to be quite trendy at the moment...thankfully...it's also good for us! Looks good! I was excited to hear about jackfruit the first time and enjoyed it. I've had it a few times since then - I just wish it was a little higher in protein like the other fake meats. But I'm with 'ya - not a fan of fake meat in general.